For me, attending UK Games Expo in the past has meant preparing and running five or six games – and probably misjudging that prep until the last moment. This year I chose to run only three games and opted to focus on adventures – or, at least, set-ups – that I have run before. 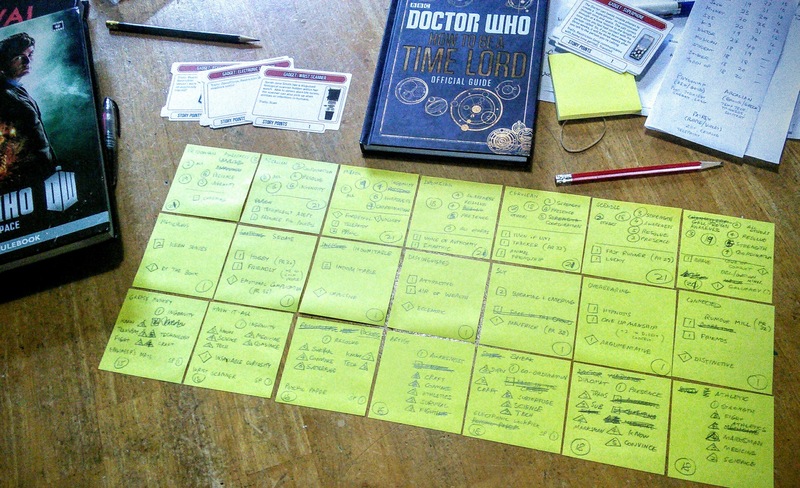 For Doctor Who, that meant that I rolled out my handy reference cards, quick pre-gen Time Lord character cards, my GM screen and the ‘War Doctor’ Special Edition rulebook. On top of that, I wanted to try a little experiment, but more on that later. As you can see from the picture, we had cookies. I think they were a bribe. It didn’t work. So, Saturday morning was Doctor Who (using the Vortex system) and I had a group of 5 (with an explanation for the missing player due to a last moment change of plans). Three of the players were a mother, father, and son group – which actually had no impact at all. At one point, Kelly (the mum) had a choice to save one character from three knocked unconscious by blow darts — and to my surprise she didn’t opt for her husband but rolled a die instead! I opted to use an old FASA adventure – The City of Gold, which finds the time travellers discovering the Earth of 2030AD ruled by reptiles. After an encounter with a T-Rex and the discovery of a worrisome (but stable) time bubble, they have to head off into history to prevent this alternate timeline from solidifying. Favourite moment — the characters arrive in the Venezuelan jungle in 1543AD and, having travelled away from the TARDIS, fall for an ambush by Spanish conquistadors. The young lad’s character pulls his Psychic Paper and he seamlessly declares “I am a messenger of King Charles!”. I noted from running the system before that I keep forgetting Story Points – which allow you to retool, reduce damage, tweak the plot, etc. This time, I came up with the idea of co-opting Dread’s Jenga mechanic as a means of providing a team Story Point pool with an added layer of tension. I used the Doctor Who Tumbling Tardis Tower Game I picked up from Amazon. I originally purchased the set to simply us as counters – but after I got the tower the Dread-style use struck me. And it worked beautifully. Stable tables permitting, I’ll use it again. Whenever the players failed to make a roll, suffered a grievous wound, or wanted to use a skill they didn’t have – they could opt, instead, to pull a block from the tumbling tower. Sometimes that meant that more than one player would pull blocks consecutively. The tower dropped twice during the course of the game – once close to the end, which led to an extra complication for them to resolve before concluding. Sounds of dismay and calls of guidance would follow in quick succession when a player declared they would draw a block. The family enjoyed the game so much that they went off and picked up the game from Cubicle 7, along with the 8th Doctor sourcebook, on my recommendation because at heart the volume provides you with a great selection of adventures. They asked about the Quick Character Gen Cards – and I said that I’d put the link up on the website – so here’s that link to the print-and-play card sheets. 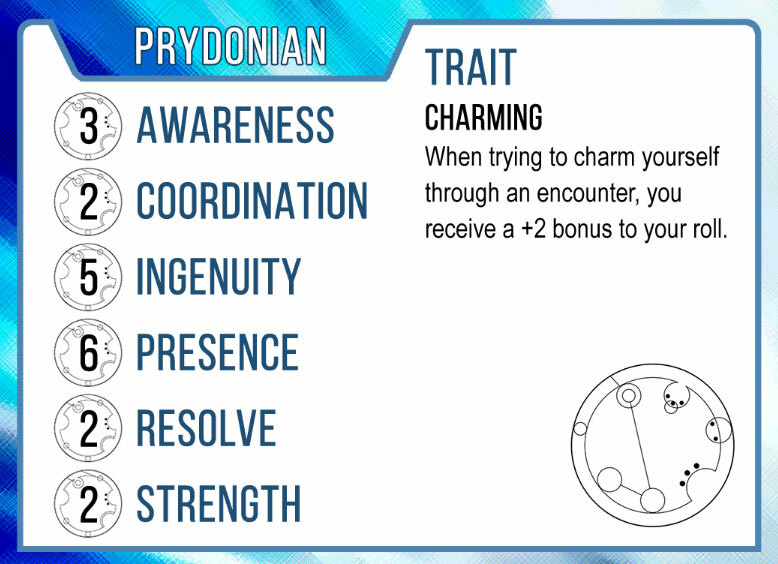 As covered in my earlier article on the Quick Gen cards, you have enough cards to create up to seven Time Lord characters and the abilities offer a good spread. The fewer players (and therefore characters) you have, the more likely they’ll need to spend Story Points to account for missing skills. I recommend lamination, but you could just print them on a piece of stiff card or use paper and card sleeves. I prefer lamination because the players can then scribble on them with a dry-wipe pen. 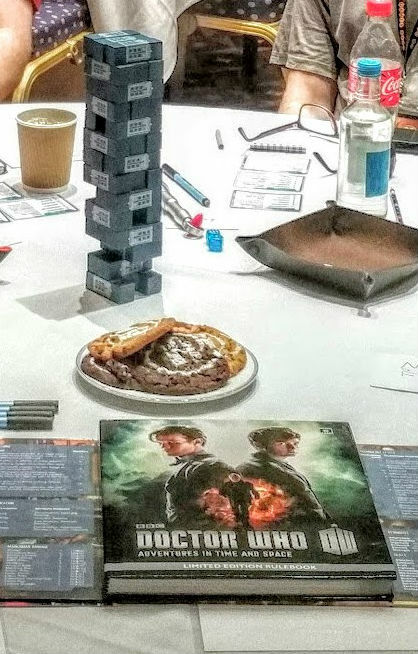 This entry was posted in Roleplaying and tagged convention, Cubicle 7, demo game, UK Games Expo on June 10, 2016 by Paul B.
I’m running one or more convention games of Doctor Who (from Cubicle 7) over the next few months, starting with this coming weekend. This past weekend, I finished creating a set of “pre-generated” character cards for the game. Essentially, they’re not complete characters by any measure – just enough to get through a session. While I could easily have done six or seven fixed character sheets, I have been pleased with card-based characters when running The Dee Sanction and Night’s Black Laundry. My thinking, why not! I plan to lay the cards down on the table and players get to choose one (or more) from each row as the game progresses. In practice, when someone pushes a challenge, then would be a good time to choose a card. Alternatively, they could take one from each row at the start of the session. Or I could hand them out at random. That’s the approach with the other games I’ve used character cards. Indeed, my last game of The Dee Sanction generated some fantastic characters right off the bat based on the cards alone. I think these cards might warrant some tweaking to achieve something like that. I’d quite like to add a random naming suggestion and maybe a motivation or two. In use, characters will possess any Skills not listed, but they’d have a value of 1. Or zero. I don’t want to go down that route. I’d rather people stick with what they’re good at. Otherwise, players can make rolls based on Attribute alone if no one has the right Skill at the given location or a specific scene. I tweaked the character generation process of my Call of Cthulhu game on the same basis around skills. I dislike the standard method that creates characters with tiny percentile chances of success on skills. All characters start with 12 Story Points. Because I’ve created the cards without the full spread of abilities, I don’t want to penalise them further! While I have given everyone a gadget worth a Story Point, it still doesn’t quite compensate. The three cards align in a column. I noticed that you could actually boil the standard character sheet down into a half an A4 column – so, why not do it with cards. The top row of cards has each of the six classes from the Time Lord Academy, plus a Gallifreyan who opted to ‘go wild’. The Shobogan made their appearance in Classic episode The Deadly Assassin. 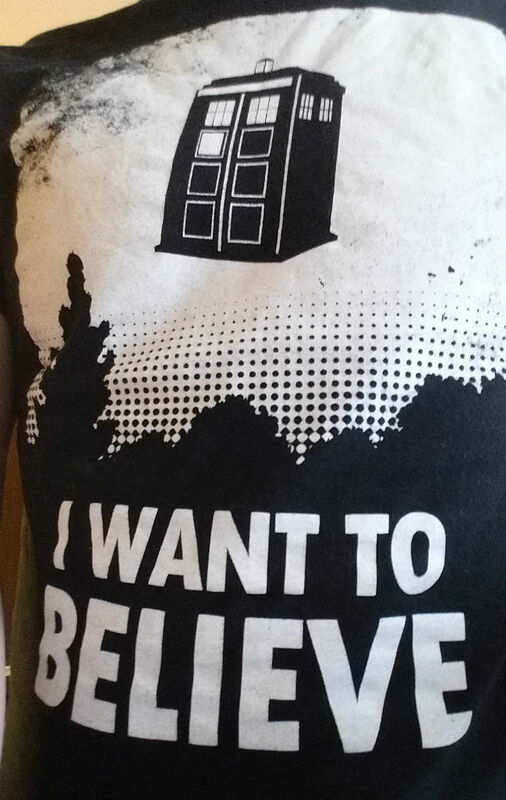 I wanted a non-Time Lord as an option, but with the potential to be involved and of value. Herein, the Shobogan fills the base roll of a more physical Gallifreyan. The middle row has aspects of personality, which serve up good and bad Traits. The bottom row fits a sort of career path, offering an extra Attribute point and key Skills. Also, extra Traits and a Gadget. My adventure concerns students escaping Gallifrey at the start of the Time War, which (from a plot perspective) excuses the shortfall in points here and there. They are, however, the best and brightest the Academy has to offer. 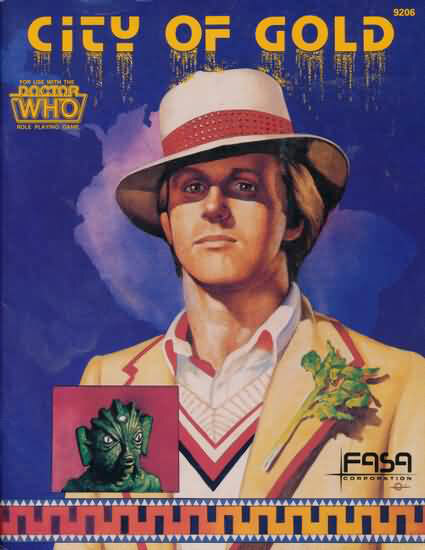 This entry was posted in Roleplaying and tagged adventure game, character generation, convention, Cubicle 7, Doctor Who, Gallifrey, The Deadly Assassin on October 12, 2015 by Paul B.